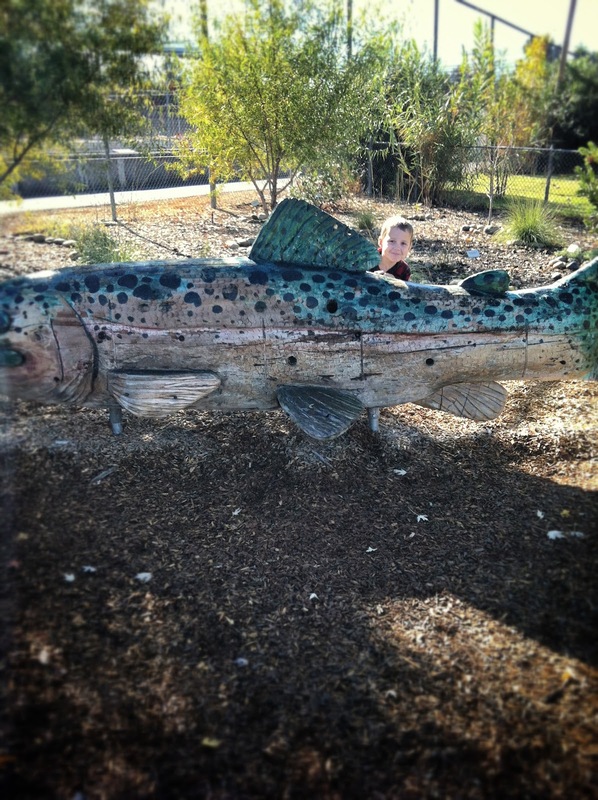 It’s Veteran’s Day and you might be wondering what a photo of my son behind a giant wooden trout has to do with anything. The funny thing is, fish remind me of my favorite Veteran. Grandpa, I love you and I thank you. It was Providential that today took us to a fish hatchery; when I look at the speckled scales of trout I think of you. I think of the summers you spent in Montana getting a suntan and viciously protecting your secret fishing spots from strangers with Uncle Arnold. I think of the stories you tell of hiking to isolated lakes in the mountains when you were younger and crazier. Or maybe just younger. You probably wouldn’t have connected these dots yourself, but your sacrifice made a trip to the fish hatchery with my boys possible. Freedom is not just an abstract term evoking flags and John Phillips Sousa. Freedom effects everything, every aspect of living, even the bizarre days that involve fish sculptures. That’s the thing about sacrifice, when you lay down your life for others, it reaches farther than you could ever imagine on your own. It reaches beyond the obvious blessings of a life unhindered by tyranny. Somehow, so many years later, it can reach a person’s great grandchildren visiting the fish hatchery, and it can reach their granddaughter, who did her best to keep everyone from falling in fish water. Perhaps you weren’t expecting to be praised in the company of a giant wooden fish, but it’s my philosophy that thanks can be given anywhere, under any circumstance. I hope you know, Grandpa, how much you have touched our lives. My life. My children’s life. I hope you know I think of you with love and thankfulness…especially when fish are around. Linking with Flowerpatch Farmgirl (Patchy, as I call her in my head and sometimes to her face) for Money Shot Monday. Check out her blog, she’s delicious! Next Next post: How To Make Pomegranate Jelly: Give the Gift of Sandwich Magic! This is so true! God can guide us to thoughts and actions he wants us to take in so many different ways. Oh, I love this. I love posts about grandparents. They especially choke me up this time of year (will probably have a post about my grandpa on Friday). Also love your new header – such cute boys. thank you, j's grandad. what a great wide-open beautiful gift, all this possibility. There I ways we have lived the tragic fallout, and ways we have lived the blessings. It is exactly this that I have been relearning lately actually. That you can weave a fish hatchery so elegantly (yes! it's true!) with thankfulness… I'm thankful for your writing. It's a gift to us! So sweet and so true! This is a great post. You are so right about thanks. Thanks can be given anywhere. I know if we could only give thanks in a formal way we would all lose out on a lot of gratefulness. Keep up the wonderful writing! “Perhaps you weren't expecting to be praised in the company of a giant wooden fish…” This really needs to go in a movie or something. It needs to be legendary. I heart you, FYI. Always have, always will.